This book definitely earns its 'quirky' label, with a number of true laugh-out-loud moments. A little too pat and glib near the end, perhaps, but your mileage may vary. At times I wasn't sure if I was reading historical fiction, YA fantasy, or a fable: but can't it be all? 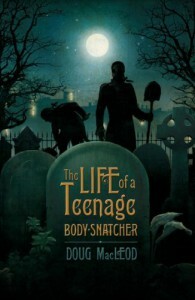 In the end, though, any book with grave-robbing, anatomists, and jokes is alright by me. A few gross-out moments might require a little discretion or warning for very very young readers.